In an electric mixer with a paddle attachment, mix cold butter, sugar, egg, and molasses on medium-low speed until thoroughly combined. In a separate bowl, stir together flour, salt, baking soda, cinnamon, and ginger. Gradually stir dry ingredients into the butter mixture. Roll one tablespoon of dough into a ball and roll it in the granulated sugar to coat. Place dough balls on a parchment lined cookie sheet, leaving 1 ½ inches between each cookie. Bake for 10-12 minutes. Cool cookies for 5 minutes before removing from cookie sheet and transferring to a rack to cool completely. I'm not a huge gingerbread or cookie fan, but these were my favorites out of my grab bag of cookies from the bake sale. Thank you so much for the recipe! I made these tonight, and my husband and I both loved them! Kristina - So glad you enjoyed them. 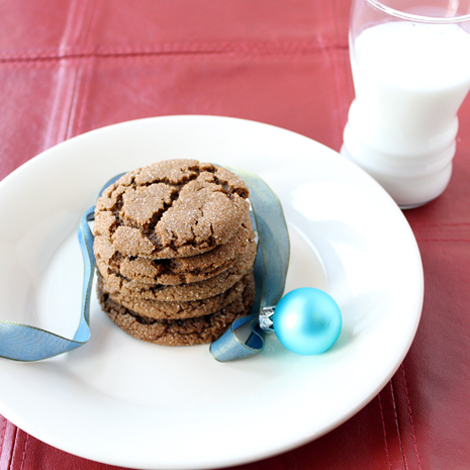 They're one of our favorite cookies... both for the holidays, and just about anytime!